Whenever I have ordered a homemade tofu at a restaurant, be it at Bunga Raya, Homeworld, Grand Park or Bei Jing Restaurant, I have never been disappointed. Deep-fried to perfection, with a hot, smooth, and custardy centre, this comforting food brings joy to young and old alike. With only two main ingredients—soy milk and egg (even though the menus often don't mention the egg, opting for a more mysterious-sounding "chef's special tofu"), and an additional bit of seasoning—it turns out this dish is not even that hard to make. Egg Tofu at Homeworld BBQ Restaurant. Line a 20cm square tray with cellophane paper or cling wrap. Beat eggs lightly and add soya bean milk, salt and cornflour. Mix well with a fork and strain the mixture into the prepared tray. Cover the tray with cling wrap and steam over low heat for 20 minutes or until cooked. Remove from the heat and leave to cool. Naturally, I ignored the part about using cling film (eww, I don't want molten plastic on my food, thanks!) and just steamed the mixture in a little pot instead. At this point, I understood the mistakes I made. By not putting some sort of covering over the top (I would pick baking paper next time), I let a "skin" form on the surface. Yellow film formed on top after steaming. And by using a small steamer dish rather than the 20cm square tray specified, I ended up trying to cook a very tall piece of tofu. While the centre was perfect, the top was still runny, and the bottom had that honeycomb texture you see in overcooked egg. It was probably not helped by the fact that our gas stovetop doesn't really do low heat. Next time, I would also try steaming in a wok rather a Western-style steamer, so that the condensation on the lid does not drip onto the tofu. Silky smooth after I poured away the liquid upper half. Honeycomb texture on the bottom (now flipped to the top for viewing). After cutting the refrigerated egg tofu into squares, I fried it in a wok, trying to simulate a deep-fryer effect by constantly spooning hot oil over the top. It didn't cook evenly, with the softer side puffing out more than the dryer side, but I didn't care about looks. Although I couldn't quite achieve a crispy outer shell, the centre of my egg tofu squares was everything I had wished for, soft and silky and delicious. Homemade egg tofu, cut into squares and fried. Impressively soft and silky centre. Yes, there was an element of fail in my experiment. But nothing could keep me from the feeling of triumph that came with eating my fried egg tofu. You can make your own soy milk by soaking, blending, draining and boiling the beans. However, if you want to go for the easy option, purchase a bottle of unsweetened soy milk from your nearest Asian grocer. The ingredients listed should only be soy beans and water. Do not try to use the Western-style soy milk that has been processed to taste more palatable to those used to cow's milk. For instance, Vitasoy's "original" soy milk has been flavoured with barley, sugar, salt, oil and kelp, in addition to an unspecified natural flavouring. The So Good "regular" soy milk contains only 3.5% soy protein, and again has added sugar, oil, various minerals and vitamins, and flavouring. The brand of soy milk I chose had this label. It came in a plastic milk bottle with a blue top, in the refrigerated section of the supermarket. 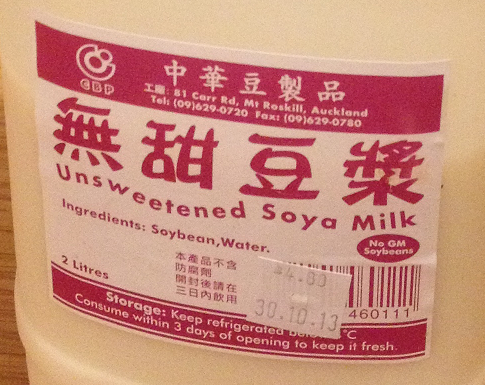 Chinese soy milk good for making egg tofu, amongst other things. This post is part of Our Growing Edge, a monthly blogging event aimed at inspiring us to try new things. This month it is hosted by Alice from Nom Nom Cat. I've been meaning to make this for ages! Now that I've read your excellent instructions I have no excuse. If you don't mind my asking, what sauce did you put on the fried tofu? Is it just soy sauce? You are on the right track with soy sauce, but by itself it is far too salty! It needs plenty of water, and a bit of sugar too. Some people also add a bit of oyster sauce. Hope it goes well and have fun! Oh, I found a couple of blog posts that give a recipe for the sauce too. Yum! 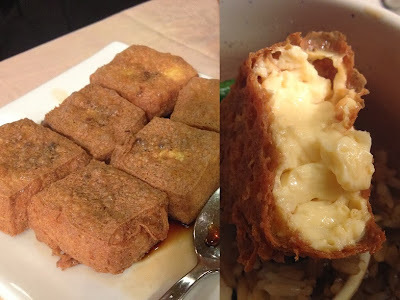 I love the deep fried egg tofu. It's funny how every restaurant says it's their own restaurant specialty! Haha, my thoughts exactly! I guess it's a specialty because they make it in-house, and I suppose they might use their own stock blend in some instances too. Oh, at first I thought you had made deep fried milk! But this looks different. I was quite surprised at: "The So Good regular soy milk contains only 3.5% soy protein". I don't buy soy milk but I know people that drink soy for health reasons. It's hardly soy milk at 3.5%. I had no idea So Good had so little soy either! When I am feeling ambitious, I will definitely give deep fried milk a go. Am tempted to buy a deep fryer too. Thanks, would love to know how it goes for you too. My family ALWAYS orders this if it's on the menu. This is one of my favourite things to have -I'm definitely going to try this soon! I bought this at Dahua on Dominion Road, but I imagine it would be at other Chinese grocers too. It doesn't matter so much what the brand is, as long as it is plain soy milk made with just soy beans and water.